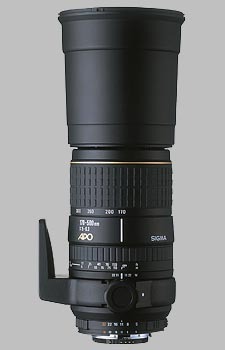 (From Sigma lens literature) This compact aporchromatic ultra telephoto zoom lens covers the range of 170mm to 500mm and it is ideal for taking sports, nature and landcape photographs. This lens uses one aspherical lens and three SLD elements for excellent correction of chromatic aberration. Color aberration in the secondary spectrum is compensated by using three pieces of Special Low-Dispersion glass (SLD), and making high-quality images a reality throughout the entire zoom range. The five-group zoom and rear focus systems ensure high performance stability and ease of use. A removable tripod collar is included as a standard component. I picked this up to replace a 500 mm Reflex. Image quality is good to very good. Good technique is a must, the field of view is too small to tolerate sloppy shots. Can be handheld in bright sunlight, otherwise a tripod is required. The tripod collar is at the extreme rear of the lens, I had to make an extension plate so that I could use an RC 2 quick release plate. Without the extension plate, the release lever on the tripod head was blocked by my vertical grip.